After previous false alarms in the last few months, South Africa's first Black President and anti-apartheid icon - Nelson Mandela has died. His death was announced by South Africa's President Jacob Zuma. 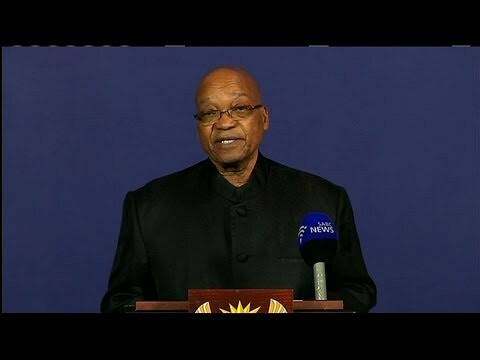 In a statement on South African national TV, Zuma said Mr Mandela had "departed" and was at peace. The 95-year old led South Africa's transition from white-minority rule in the 1990s, after 27 years at Robben Island prison where he did hard labour in a lime quarry. Mandela had been ill in recent years including repeated hospitalisations with a chronic lung infection. In April, he spent 18 days in the hospital due to a lung infection and was treated for gall stones in December 2012. As a result of his declining health, his public appearances had become increasingly rare - the last being in July 2010, when he attended the final match and closing ceremonies of the FIFA World Cup which was hosted by South Africa. In 2011, Mandela met privately with United States' First Lady - Michelle Obama when she and her daughters travelled to South Africa. Mandela was born in 1918, the son of a tribal leader, in a remote village in South Africa. His tribal name, Rolihlahla, meant "troublemaker," a moniker Mandela would more than live up to in his lifetime. In 1952, he emerged onto the national stage when he helped organise the first country-wide protests called the Defiance Campaign. That same year, he opened the country's first black law firm. Ruth Mopati, his secretary at the firm, wrote about the way he was then in the book "Mandela," saying, "He was able to relate to people with respect and therefore he was respected in return." While Mandela's party, the African National Congress, had always been dedicated to non-violence, in 1960 the ANC was banned to prevent further protests after police shot dead 69 black protestors in what became known as the Sharpeville massacre. The events radicalised the organisation and led to the creation of the ANC military wing, for which Mandela became its first commander in 1961.